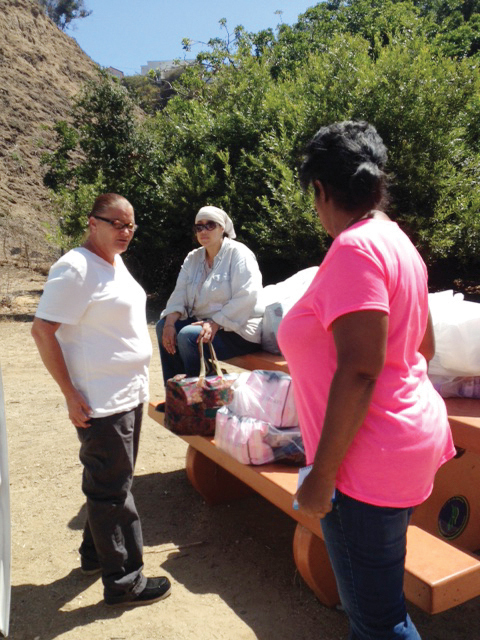 Late in 2015, when the Pacific Palisades Task Force on Homelessness (PPTFH) asked the community to help fund two social workers for three years at $120,000 a year, many residents donated, but others questioned whether this grassroots approach would actually get the homeless off the streets and out of the canyons. Nine months into the program’s first year, the efforts by law enforcement and two OPCC social workers—hired by the PPTFH—is succeeding. Slowly, one by one, the homeless are getting help. OPCC social workers Maureen Rivas (left) and Glanda Sherman (right) help a homeless woman find housing. Of the homeless the PPTHF has tracked, the social workers have reached out to 79, know their names and speak with them about getting services. So far 17 have accepted services or housing. The PPTHF’s initial success has relied on the work of social workers Glanda Sherman and Maureen Rivas, supported by law enforcement and PPTHF volunteers. In particular, the beach bicycle patrol team of Rusty Redican and Quenten Blanton is proving effective. They approach the homeless who are living in high-hazard fire zones along PCH or camping on the beach, and tell them they can’t stay. Then, Sherman and Rivas visit these homeless individuals and offer shelter and services in the Santa Monica area. Jimmy Dean, who had lived in lower Temescal Canyon just under Larry McNally’s home off Radcliffe for the past three years, was recently moved off the streets. “That site has been occupied for approximately the last seven years,” McNally said. “First by a fellow named Thomas Brothers, who would steal women’s undergarments and display them on a clothesline. McNally said that both Brothers and Dean would rant and rave throughout the night. With the canyon-wall acoustics, residents living above could hear nearly every word. McNally estimated he called the police 25 times. He said he never approached either person, because “I didn’t want potential retaliation. The male homeless person found his way up to my neighbor’s door, after she had yelled at him to quiet down. McNally contacted the PPTFH about Jimmy Dean. Social worker Rivas came to the sight of Dean’s encampment and spoke to the homeless woman and asked if she would like services or housing. She refused. Rivas then returned and asked Dean again if she would reconsider housing. This time she agreed, and she’s now off the street and receiving services. Three members of the PPTHF—Sharon Kilbride, Patrick Hart and Nancy Klopper—have divided the Palisades into five areas and each of them regularly visit homeless encampments and have mapped the sites out. They share the information with LAPD and the social workers. “There is constant visitation and a con- stant revolving window of opportunity,” said Kilbride, who explained that as soon as a site is vacated, the group must be vigilant, because other homeless will move into the “primo” sites. PPTFH has paid for business cards that are being handed to the homeless and to residents. The number, (310 460-2630, goes to a voicemail, and the social workers pick up the messages. “It is meant to be for both the homeless (to ask to be connected to services and housing) and residents to let the Outreach Team know about encampments,” said McCormick, who hopes that the Chamber of Commerce will soon make the cards available to businesses. Additionally, the PPTHF Board meets with the social workers and LAPD officers once a month to discuss the person(s) they want to target for help the next month. On August 30, the meeting centered on the best way to help the following homeless during September: Timmy; a young girl (dubbed Pretty Blond) who so far has not allowed workers to approach her; Dexter; Brennon and Leron. At the monthly PPTFH strategy meet- ing at the end of August, helping Timmy in September was prioritized because of the number of complaints received about his urination in front of passers-by, the sidewalk garbage/clutter he lived with on Alma Real and later Sunset, and the occasional rants he goes into. He had relocated to Brentwood for a few months, before being booked for trespassing on private property, according to Senior Lead Officer Michael Moore. Once he was released, he returned to Pacific Palisades. It seems that although Timmy is lucid and can carry on conversations, at other times he appears to have mental health issues. PPTFH members have had interaction with him and say he is smart. A big problem in getting Timmy to accept services, including transitional housing, is that several people in the Palisades enable him by giving him food, money, goods and company, which makes it harder for the social workers to get him off the street. In the past, Timmy has said he would move if he could have a place near a Wells Fargo bank and a grocery story like Ralphs. He also said the environment must be non-threatening and have no Mexicans, Asians or blacks. “Which is funny,” said OPCC social worker Maureen Rivas. “I’m Mexican and Glanda is black,” referring to her coworker, Glanda Sherman. Rivas and Sherman, who speak with Timmy regularly, are now going to bring in workers from the Department of Mental Health to speak with him. This is sort of a last option for a homeless person with whom they feel they have hit a “brick wall. You may have seen the heavy-set young black man holding a “Food” sign at the back of Ralphs’ parking lot, across from the 881 Alma Real building. 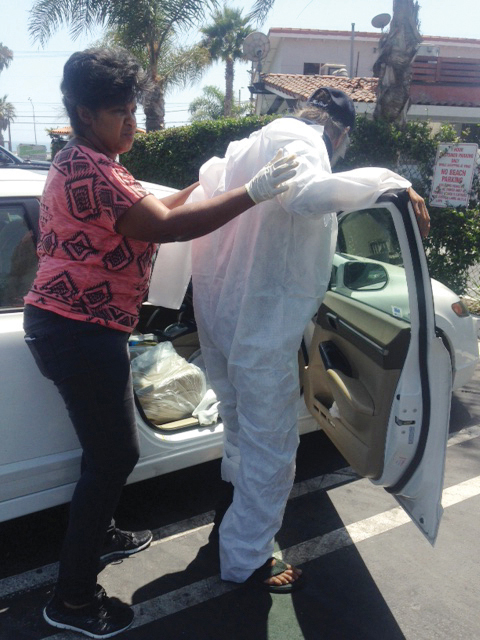 A long-time homeless man, who had made the bus stop in front of Vons his home, has agreed to take services and find a safer living environment. When Officer Rusty Redican stopped to speak to the man, Leron, several women came up to Redican and complained that Leron had asked them for sexual favors. Another woman, driving by, saw Redican speaking to Leron and stopped in the street; she rolled down her window and shouted that she, too, had been approached. Members of the PPTFH were asked what women are supposed to do if that happens. Call 911? Stick around to make a citizen’s arrest when the LAPD shows up? Reporting the incident is essential for follow-up work to eventually deal with the person. If the incident is not reported, then there is not sufficient information to take action.